Made from pure damask rose water, distilled from the delicate petals of thousands of fragrant Bulgarian roses. 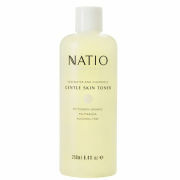 Its mild astringent quality tones the skin after cleansing. Leaves the skin feeling comfortable and really fresh. Apply to cotton pads and wipe over face and neck after cleansing or to refresh during the day. Follow with serum, face oil and moisturiser.